Watching fresh snow fall from the heavens. Rhythmic magic, drifting in peaceful purpose, as if called for calm by its Maker. Until that day in May, six months later. Having arrived early to pick up my kids from school, I was enjoying my last moments of quiet for the day, when, to my southern surprise— fluffy, fat drops, clothed in white, began dancing along my windshield. Does it never get warm around these parts? Hey, Mother Nature, in case you’ve lost your calendar…it’s Spring! This Florida girl had had her fill of freezing weather, thank you very much. Looking out my window as I write this morning, delicate snow-puffs catch in the wind this early spring day. For many, it feels like the winter that just won’t quit this year. Soft beauty elegantly falling—in the wrong season. And yet, there’s just something about snow that makes you want to forgive it. Maybe it’s the south in me, but even when snow pushes the boundaries of its season, I can’t help but be charmed by its gentleness. A grace shower, it is. Seems to me that beauty is subjective. That it adapts to its surroundings, malleable to the most unforeseen of moments. The barely-visible green of blossoms pressing up against lacy, white snow—two seasons converging. The long winter of pain, bumping up against the comforting spring of relief. Beauty beneath the surface—greeting beauty in the light. Both submissive to their parts of the story. Winter and Spring. Rising up, becoming one. I love this, Brenda. A grace shower of snow. Beauty is, indeed, a matter of perspective. Oh, how I need to open my eyes! Beautiful post…two seasons bumping up against each other…one bringing hope. yes, how can we not forgive those beautiful plump flakes that fall….I guess because we don’t have to shovel them lol. Praying for hope and renewal all around. It’s such a God moment to experience and appreciate the beauty in the simple things of life-like a spring snow. However, I am happy that this storm missed us here-I’m ready for Spring! Thanks Brenda for the beautiful perspective, as always! Beautiful word pictures, my friend! We’ve had an incredibly dry winter (cold, though). I long for some rain or snow to soak into the brown and crack open the green. The desert always astounds me because it DOES get green-tinged despite the lack of moisture. And still we “bump”–spring into winter; winter into spring depending on the day. I know that March snow cannot last, and it’s so lovely today outside my window that it’s hard to be grumpy. I love how you can see both sides of the season, finding the beauty in it all. I’m here looking at snow today, content with the promise that spring will come because winter never stays. Grateful for the seasons. This is exactly what I thought the other day when I saw it falling afresh. “Soft beauty elegantly falling—in the wrong season. “Winter and spring, rising up, becoming one.” Love that picture! What a beautiful post Brenda! I love your writing Brenda! It reached out to me like balm for my soul this frosty cold morning. Love your thoughts here, Brenda! I’m enjoying the LARain – the rhythmic, cleansing and refreshing nature of it all. And you are right – it reminds me of hope. Hope realized. 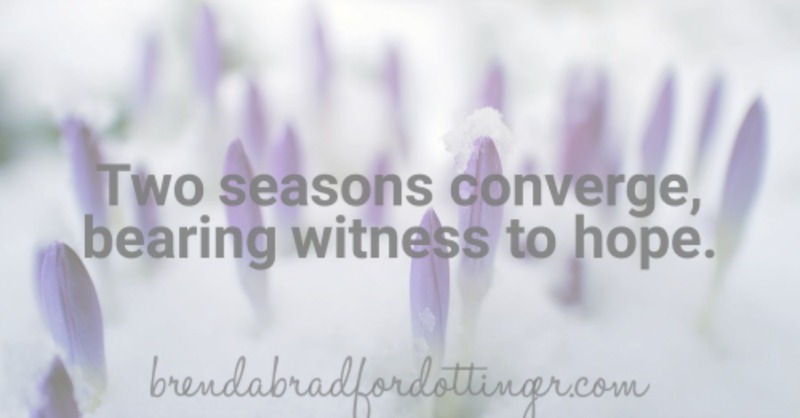 Your post today is a beautifully poetic vision of a God who can converge two seasons and cause us to stand in awe. I can read this over and over again. for sure, it seems like winter won’t quit … ever. this is when hearing from our friends in the south and seeing life through their lenses offers us breaths of fresh air. i’m breathing deep with every image of spring that’s coming my way! Cold here in Ga. we’ve had our dusting of snow, you have to be up in the mountains to get more. It is beautiful though, March going out like a lion really windy. Beauty upon beauty, lovely phrase, thanks Brenda. Beautiful post, Brenda. It’s funny but here we braced for our 4th Nor’Easter in March. It did snow but nothing stuck & I found myself slightly disappointed. As I read your post, I realized there are times we may just not be ready for the next season. We try to hold onto the present. Other times, we want to rush through to the next one. May my heart find peace in embracing the current season and embracing the beauty in this moment. Neither lagging behind nor rushing ahead. But keeping step with our God who is over every season. Thank you friend! Brenda, I didn’t realize you’re a Florida girl! I am too — born and bred. Where are you from? I can only imagine that when spring finally comes fully, it will be very welcome. Our spring is on and with it the pollen and leaves. But the flowers are beautiful. A grace shower being snow, love this, it is soft and gentle even when it snows hard. We are experiencing lots of rain here in southern CA. We certainly need it but even with something so refreshing there can be drama, like mud slides. Heaven will be snow without the fleet and ice that is so dangerous, rain without mud slides and flooding. Oh that is a lovely way of looking at snow in May. Here in New England winter is hanging on and giving us a taste of what for. We’ve had 3 nor’easters since spring began on the calendar. I can smell spring in the air though so I have faith that her sweet little graceful self will be here soon. Brenda, I so enjoy your way with words; your perspective. Our lingering season is a bit frustrating. Yet, I can’t deny the joy I feel when unexpected snow showers fall. It’s much like experiencing joy in the midst of trial. Thank you for sharing your gift with us. Brenda, I especially enjoyed this post tonight. We’re having a unusually cold spring in Texas, and I was thinking the exact same thing. As the cool breeze wafts through our block, I’m thinking about your words, “Soft beauty elegantly falling – in the wrong season.” I love how God has no boundaries…seasonal or otherwise. Thanks for sharing.